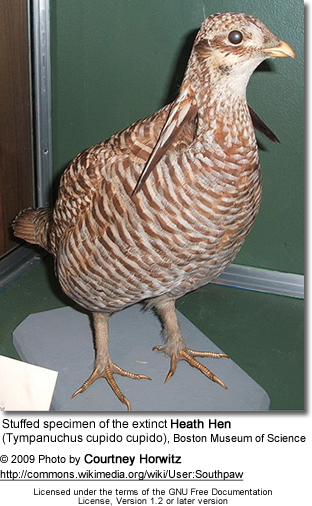 The Heath Hen (Tympanuchus cupido cupido) was a distinctive subspecies of the Greater Prairie Chicken, Tympanuchus cupido, a large North American bird in the grouse family, or possibly a distinct species. Heath Hens lived in the scrubby heathland barrens of coastal New England, from southernmost New Hampshire to northern Virginia in historical times, but possibly south to Florida prehistorically. The prairie chickens, on the other hand, inhabited prairies from Texas north to Indiana and the Dakotas, and in earlier times in mid-southern Canada. Heath Hens were extremely common in their habitat during Colonial times, but being a gallinaceous bird, they were hunted by settlers extensively for food. In fact, many have speculated that the Pilgrims' first Thanksgiving dinner featured Heath Hens and not wild turkey. By the late 18th century, the heath hen had a reputation as poor man's food for being so cheap and plentiful; Thomas L. Winthrop related that they could be found on the Boston Common and that servants would sometimes bargain with a new employer for not being given Heath Hen for food more often than 2 or 3 days a week. Very similar to the Greater Prairie Chicken of the Plains, but slightly smaller (Pearson, 1917). Length of the bird was approximately 17 inches (43 cm) and weight was about two pounds (900 gm). A specimen weighing three pounds was claimed by Alexander Wilson but that figure was not verified by later ornithologists (Pearson, 1917, Forbush, 1927). Owing to intense hunting pressure, the population declined rapidly. Perhaps as early as the 1840s, at any rate by 1870, all Heath Hens were extirpated on the mainland. There were about 300 left on the island of Martha's Vineyard, off Massachusetts, but by 1890 this number had declined to 120-200 birds, mainly due to predation by feral cats and poaching. By the late 1800s, there were about 70 left. These were protected by a hunting ban and the 1908 establishment of the "Heath Hen Reserve" (today the Manuel F. Correllus State Forest) and the population rapidly grew to almost 2000; by the mid-1910s, observing the birds on their lekking grounds had become something of a tourist attraction. However, a destructive fire during the 1916 nesting season, severe winters, inbreeding, an excess number of male individuals and apparently an epidemic of blackhead disease which might have been transmitted by poultry brought the numbers down quickly; after a last recovery to 600 in 1920, the population began its final decline. In 1927, only about a dozen were left - a mere two being females - despite being afforded the best protection according to contemporary science, and that number had declined to a handful, all males, by the end of the year. After December 8, 1928, apparently only one male survived (Gross, 1931), lovingly nicknamed "Booming Ben". He was last seen on his traditional lekking ground between West Tisbury and today's Martha's Vineyard Airport on March 11, 1932 - early in the breeding season -, and thus presumably died, about 8 years old, days or only hours afterwards from unknown causes. Heath Hens were one of the first bird species that U.S. Americans tried to save from extinction. As early as 1791, a bill "for the preservation of heath-hen and other game" was introduced in the New York legislature. Although the effort to save the Heath Hen from extinction was ultimately unsuccessful, it paved the way for conservation of other species. Ironically, the establishment of the reserve on the open shrubland of what was then called the Great Plain may have accelerated the Heath Hen's extinction. Fires were a normal part of the environment, but with the attempt to suppress fires instead of enforcing ecological succession with controlled burns, habitat quality decreased and undergrowth accumulated until a normally limited fire would have disastrous consequences as it did in 1916. Realizing the degradation that has affected the State Forest (and although it does hold remarkable biodiversity, prevents it from being utilized to its full potential), reestablishment of the original shrubland/heath/woods mosaic and eventual reintroduction of Greater Prairie Chickens as an "umbrella species" that serves as an indicator of good habitat quality is being discussed since the late 1990s. This discussion has spawned several research projects to find out more about the Heath Hen and its habitat. A first mtDNA D-loop haplotype comparison between Heath Hen specimens and prairie chickens (Palkovacs et al., 2004) brought the unexpected result that all heath hens tested formed a group very distinct from mainland birds, being most similar genetically to Great Prairie Chickens from Wisconsin. A more recent study (Johnson and Dunn, 2006) of the same parameter verified these results, but disagreed in the placement of the Heath Hen respective to its relatives, suggesting a closer relation ship with the Lesser Prairie Chicken instead. However, Johnson and Dunn caution against reading too much into these results: while the Lesser Prairie Chicken is considered a distinct species and the genetically apparently equally distinct Heath Hen would thus likewise deserve species status, mtDNA haplotypes in small populations that have undergone bottlenecks are likely to show higher divergence than they would judging from taxonomic status alone (Johnson et al., 2003; see also genetic drift). Thus, given the fact that all Heath Hen specimens from known localities studied by Johnson and Dunn are Martha's Vineyard birds - where the population may never have exceeded several thousand due to the limited space and genetic exchange with the mainland was limited -, it is possible that the low genetic diversity and apparent distinctness of the Heath Hen are an artifact of the small number of useful specimens, all from the same, closely-knit population. Prairie chickens were indiscriminately introduced to the Eastern Seaboard after the Heath Hen was gone from the mainland, but failed to thrive. There exists a considerable number of supposed Heath Hen specimens in public collections today, but many - all mainland specimens and those with insufficient locality information - cannot be unequivocally assumed to be Heath Hens. For example, a mere 7 unequivocal Heath Hen eggs - equivalent to a very small clutch (Luther, 1996) - are known to be held in public collections today. That the genus Tympanuchus apparently evolved rapidly and therefore has high morphological but low genetic distinctness between taxa further complicates research. The apparent distinctness and the failure of the early introductions raises the question of whether the Heath Hen was uniquely (by comparison with its relatives) adapted to the more oceanic climate of its former area of occurrence, and in consequence, whether a future attempt to establish a population of the western birds on Martha's Vineyard could be bound to fail, possibly even by competing for funding and other resources jeopardizing the extant but much declined populations of the prairie chickens. Clearly, more research is necessary, for example by analyzing mainland specimens to determine whether they can be assigned to a taxon from molecular and morphological characters.